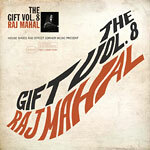 The eighth installation in House Shoes' acclaimed curatiorial ''The Gift'' series features Detroit musician Raj Mahal, and features bonus previously unreleased tracks. Liner notes by Dart Adams. Raj Mahal was a colleague of House Shoes in the Detroit hip-hop scene in the 1990's, a scene he joined just about the time ''Fantastic Volume One'' was recorded (1996). When he moved to Chicago and refined his style, there was widespread talk that Raj would follow in the footsteps of other Detroit alumni by releasing a proper album. That album has finally come.